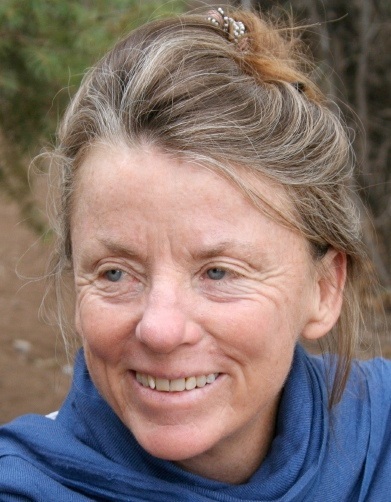 Darvesha Victoria MacDonald is a Murshida in the Sufi Ruhaniat International lineage, a Ziraat Experienced Farmer, and a Buddhist practitioner. What Darvesha teaches is based on her understanding and experience of interdependence arising originally in her Buddhist practice. 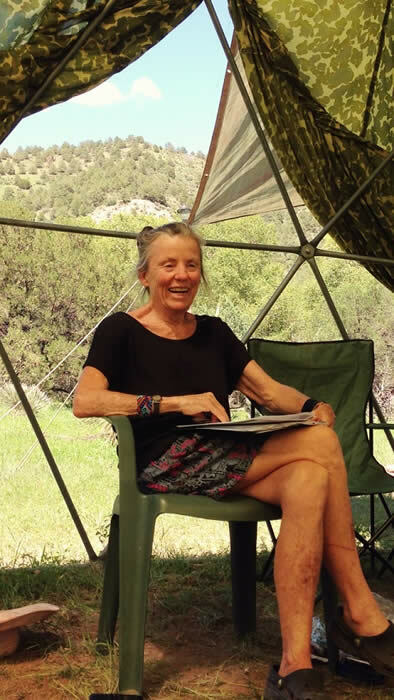 Her teaching encompasses themes of sustainability, deep ecology, simplicity, sensory awareness, movement awareness, mindful eating, and feminine spirituality. When it comes to personal growth practice she tries to create a space in which students and mureeds are able to look at where there is self-deception blocking their direct experience of the Ultimate. She draws on practices from all 3 branches of Buddhism and from the Inayati lineage of Pir-o-Murshid Hazrat Inayat Khan. Darvesha is a Senior Mentor of the Dances of Universal Peace. She has served as Chair of the Guidance Council since June 2007 and as President of the current DUP International board of directors since January 2008. She has travelled extensively worldwide teaching and leading the Dances. Her major focus for the last 20 years has been seeding the Dances in South America and encouraging local leadership and mentorship. Her areas of special interests in leading are the Aramaic work of her Sufi guide Saadi Neil Douglas Klotz, the dances of the divine feminine, and zikr. Below Darvesha writes about her personal journey with the dances - how they transformed her and where they have led her. When I found the Dances and Walks in the eighties, I felt like I was stepping into a swirling Zendo. Here I could continue to do my Buddhist sitting practice of self-witnessing, in action with sound: the perfect place to practice meditation in action. Within Buddhist teachings I had found resolution to the koans of life that had plagued me since I was a pre-teenager when my father died at a young age. But now it was time to bring those understandings into the heart. When I encountered “the glance” in the Dance Mandala, repressed, unprocessed grief arose. For several years tears continued to stream down my face as I looked into one loving pair of eyes after another. After living for years with the feeling that others found my sadness unacceptable, I gradually found that my tears touched a similarly delicate place in others, and that showing grief is not something to be ashamed of, but a gift. I know, from my own experience, that the Dances create a therapeutic and transpersonal environment, where one can dwell in spacious awareness, witnessing one’s own emotions rising and passing, within the loving glance and touch of another, who is there with acceptance and no agenda to ‘fix’ or change. Now, so many years later, I still feel my heart continuing to expand when I am in dance circles. It all started on my way home to California after my first year in Asia. One early morning that year, while doing a Vipassana retreat in a Thai temple in Bodhgaya, the stupendous gong from the neighboring Zendo shimmered through me. That was the moment I realized sound is not superficial, but a pervading vibration. Until that moment I had lived on the surface of sound. It was earlier that year at Kopan Gompa when Jon Landaw demonstrated emptiness by bringing the striker together with the gong, that I understood emptiness. Now I wanted to explore the mystery of sound! I was in a restaurant in Santa Fe, on my way home to San Francisco, when I saw an announcement for Saadi’s Lucid Voice class at the Mentorgarden in San Francisco where I was headed. In those days Saadi would often say, “Sooner or later you have to take your stand somewhere.” One night in class I glanced down at his papers spread out on a bench, and noticed the mission statement for the Dance Center. “I could commit to that!” And so I did. At the time I was studying conscious movement with various teachers. Naturally I was drawn to the somatic aspect of the Dances. I was also studying Deep Ecology, and found that I could share this philosophy though the dances. For me the Dances are a vehicle through which to share my understanding of Buddha Dharma, Interdependence, and Presence. Eventually it was no longer enough to teach about it. I had to live it. I had to undertake what Gary Snyder calls “The Practice of the Wild” and “Practice of Place” Ishan (my partner) and I live in the middle of the Gila Forest. Our front porch is set up for year-around outdoor sleeping, and 9 month-a-year cooking. The house is just back stage. Here I have a chance to break through the hallucination of separation from the nature that I am. This is the playground of Ziraat. Here Nature is our book: The eerie night cry of the mountain lion; waking up in the mornings to intersecting birdsongs, as well as calling cards left by the trickster coyote that we have never seen; the earthy grunting of the javelina coming after “my” flowers; the casual amble of the bear, indifferent to us; the dance of the Wild Turkeys on Thanksgiving day; the peace that descends with the silent landing of the blue green heron at the water’s edge; the different dialects the wind speaks through the various species of trees; the different songs the stream sings as it swells with rain and then subsides again; the scent of the earth after a night of intermittent rainfall; a delicious dip in the stream, after a hot summer day of work on the land; and taking up my shopping basket and walking over to the garden to harvest the spiritual gift of tonight’s dinner.